Our inventory currently contains 4768 matches against your search criteria. Yup, they're all here, Mr. T., Hannibal Smith etc battling the Sumo VF/NM $10 Make An Offer! White pages, poster intact NM- $15 Make An Offer! White pages, water staining VG+ $90 Make An Offer! Offwhite/white pages VG+ $90 Make An Offer! Offwhite pages VG $150 Make An Offer! Offwhite pages, cool pirate cover F/F+ $180 Make An Offer! VG- $10 Make An Offer! F/VF $18 Make An Offer! VF/NM $47 Make An Offer! NM- $58 Make An Offer! missing a page, does affect story Pr $1 Make An Offer! offwhite pages, cover detached from bottom staple G $4 Make An Offer! Offwhite pages, Nemesis battles Hitler F $15 Make An Offer! Cream/offwhite pages, small 2 written on front cover in pencil CGC 6.5 F+ $300 Make An Offer! Cream/offwhite pages, small R written on front cover G+ $175 Make An Offer! Cream/offwhite pages, small R written on front cover G+ $70 Make An Offer! Cream/offwhite pages, 2 inch piece off top of spine Fr $25 Make An Offer! Cream/offwhite pages VG $85 Make An Offer! Cream/offwhite pages, cover split to top staple, small piece out of spine, bottom right corner Fr $10 Make An Offer! Offwhite/white pages, centerfold detached from bottom staple G- $4 Make An Offer! Offwhite pages G- $16 Make An Offer! Cream/offwhite pages CGC 9.4 NM $275 Make An Offer! Don Rosa $14 Make An Offer! Cream/offwhite pages VG $40 Make An Offer! Offwhite pages VG $22 Make An Offer! White pages G+ $15 Make An Offer! Offwhite pages, P3-15 written on front cover in pen VG $22 Make An Offer! White pages, CO 3/9 written on front cover G+ $15 Make An Offer! White pages, CS 124 written on front cover VG $22 Make An Offer! White pages, C7/13/ written on front cover VG+ $26 Make An Offer! White pages, C9/26/ written on front cover, 1' bottom spine split G $11 Make An Offer! White pages, C11/9/ written on front cover VG+ $25 Make An Offer! Offwhite pages, water stain back cover F $24 Make An Offer! White pages, C1/17/ written on front cover VG+ $18 Make An Offer! White pages, C3/15/ written on front cover F $20 Make An Offer! Offwhite pages, P3-8 written on front cover in pen VG+ $20 Make An Offer! White pages, C5/10 written on front cover F- $18 Make An Offer! White pages, C7/26/ written on front cover F+ $30 Make An Offer! White pages, C9/19 written on front cover F/VF $35 Make An Offer! VF- $35 Make An Offer! White pages, cover almost detached, C11/15/ written on front cover G $7 Make An Offer! White pages, cover detached from bottom staple VG+ $18 Make An Offer! White pages, C5/91 written on front cover F/VF $30 Make An Offer! offwhite pages Fr $3 Make An Offer! White pages, cover detached from top staple VG+ $15 Make An Offer! White pages, C9/11 written on front cover, small hole near spine VG+ $15 Make An Offer! White pages, C1/13 written on front cover, cover detached from top staple VG+ $15 Make An Offer! White pages, C5/17 written on front cover F/VF $30 Make An Offer! F+ $32 Make An Offer! White pages, C9/19 written on front cover VF $70 Make An Offer! White pages, C11/8/ written on front cover VF+ $95 Make An Offer! F+ $25 Make An Offer! White pages, tiny C1/30 written on front cover VF+ $95 Make An Offer! White pages, C3/21/ written on front cover F/VF $40 Make An Offer! White pages F $20 Make An Offer! White pages, C9/25/ written on front cover VF $45 Make An Offer! White pages, C6/18/ written on front cover NM- $100 Make An Offer! White pages, C7/23 written on front cover VF+ $70 Make An Offer! Offwhite/white pages, light stain upper right corner of back cover F $12 Make An Offer! Offwhite/white pages, small stain top right corner of back cover F $12 Make An Offer! White pages NM- $180 Make An Offer! Rich colors, offwhite pages VG- $10 Make An Offer! Offwhite/White pages, small tear on back cover F/VF $200 Make An Offer! Offwhite/White pages, AUG 13 stamped on front cover VF $175 Make An Offer! Offwhite/White pages, tiny tear bottom spine VF/NM $210 Make An Offer! White pages, rich colors VG+ $55 Make An Offer! Offwhite/White pages, tiny tear bottom spine VF/NM $160 Make An Offer! White pages NM-/NM $70 Make An Offer! White pages, stain bottom front/back cover CGC 6.5 F+ $50 Make An Offer! white pages, Netflix Season 2 March 8th 2018 NM- $4 Make An Offer! White pages, Dynamite 2014 issue NM+ $10 Make An Offer! 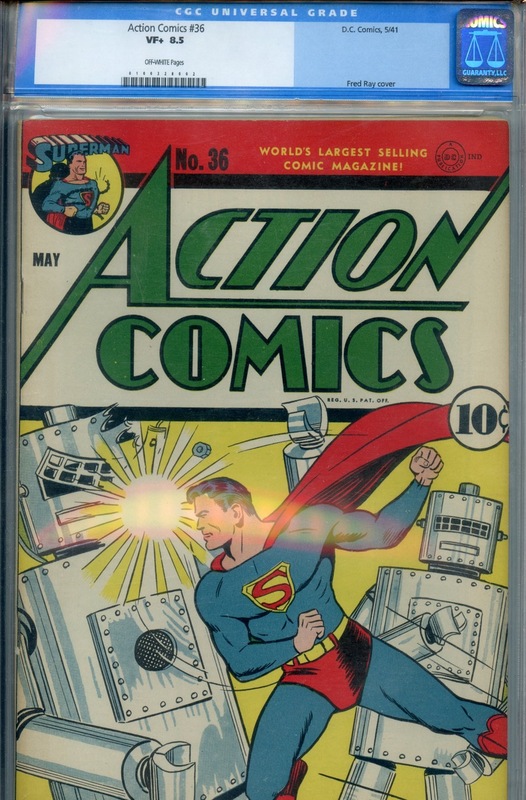 Cream/offwhite pages, MAR 11 1949 stamped on top of back cover CGC 5.0 VG/F $700 Make An Offer! Light Tan/offwhite pages CGC 5.0 VG/F $83,500 Make An Offer! Offwhite/white pages CGC 4.0 VG $825 Make An Offer! Cream/offwhite pages, cover detached, tape on inside front cover, coupon cut out back cover Pr $80 Make An Offer! White pages VF- $17 Make An Offer! Offwhite pages, cool cover Pr $7 Make An Offer! Cream/Offwhite pages, P2-60 written on front cover in pen F $36 Make An Offer! Offwhite pages, piece out of front cover G $12 Make An Offer! Nice solid mid grade, offwhite pages F $420 Make An Offer! tape on inside spine, offwhite pages VG+ $300 Make An Offer! Cream/offwhite pages CGC 7.0 F/VF $2,500 Make An Offer! Offwhite pages, very nice copy CGC 7.0 F/VF $7,300 Make An Offer! Offwhite pages VG+ $55 Make An Offer! Offwhite pages, tiny RG16 written on front cover in pen VG $50 Make An Offer! Offwhite pages, 1st Sgt. Rock prototype, 1/4' tear top front cover VG+ $300 Make An Offer! Offwhite pages VG+ $90 Make An Offer! Offwhite pages, top staple pull, cover still attached, 4' bottom spine split G+ $50 Make An Offer! R315 written on front cover in pen, cream/offwhite pages G $25 Make An Offer! Offwhite/White pages VG/F $110 Make An Offer! Rich colors, offwhite pages VG/F $50 Make An Offer! Offwhite/White pages, small chip off bottom right corner VG+ $100 Make An Offer! #39 2nd Sgt Rock Prototype, 1st Easy Co.
Offwhite pages, 2nd Sgt. Rock prototype F $325 Make An Offer! Offwhite pages, small tear on right side of front cover F/VF $175 Make An Offer! Cream/offwhite pages, spine split to bottom staple G+ $34 Make An Offer! Offwhite pages VG/F $65 Make An Offer! Offwhite/White pages, tiny chips out back cover F $80 Make An Offer! Offwhite/White pages F- $250 Make An Offer! Offwhite/White pages, tiny 80 written on top of back cover F+ $70 Make An Offer! Offwhite pages VG/F $45 Make An Offer! Offwhite pages, water stains VG+ $36 Make An Offer! Offwhite/White pages, 8 9 d stamped on front cover VG/F $45 Make An Offer! Offwhite/White pages, 7 9 d stamped on front cover F/VF $75 Make An Offer! Offwhite/White pages, two small chips out of bottom front cover, 3 9 d stamped on front cover F+ $65 Make An Offer! Offwhite/White pages, 5 9 d stamped on front cover F+ $65 Make An Offer! Offwhite/White pages, 9 d stamped on front cover F+ $65 Make An Offer! Offwhite/white pages, cover/1st wrapped detached from top staple G/VG $14 Make An Offer! Offwhite pages, original owner collection VG+ $25 Make An Offer! Cream/offwhite pages, small I written on front cover VG $90 Make An Offer! Cream/offwhite pages, small R written in red marker on front cover G $32 Make An Offer! Offwhite pages, one inch tear bottom staple goes into front cover, small 7/21 written on front cover in pencil G/VG $5,500 Make An Offer! Offwhite/White pages, T8P 5P stamped on front cover F+ $20 Make An Offer! Offwhite/White pages, two small stains top of back cover F+ $16 Make An Offer! Cream/offwhite pages, tanning inside front/back covers, 175 525 14 written on top of back cover in pencil VG+ $10 Make An Offer! Offwhite/White pages, bottom staple has rust on bottom, migration to paper F $12 Make An Offer! Offwhite/white pages NM- $375 Make An Offer! Electric chair cover, offwhite pages VG+ $80 Make An Offer! Original owner collection, offwhite pages NM+ $10 Make An Offer! Original owner collection, offwhite pages NM $20 Make An Offer! Original owner collection, offwhite pages NM $25 Make An Offer! Original owner collection, offwhite pages NM+ $8 Make An Offer! Original owner collection, white pages NM+ $8 Make An Offer! Original owner collection, white pages NM- $4 Make An Offer! Original owner collection, offwhite/white pages NM+ $8 Make An Offer! Original owner collection, white pages NM+ $6 Make An Offer! White pages NM/NM+ $35 Make An Offer! Offwhite/white pages, CGC label comes with the book F $210 Make An Offer! Offwhite pages VG/F $150 Make An Offer! Offwhite pages, tiny 103 written on front cover VG $135 Make An Offer! Offwhite pages, staple tears bottom staple, 1-11 written on front cover VG+ $135 Make An Offer! Offwhite pages G $60 Make An Offer! Offwhite/white pages, slight marvel chipping along right edge of front cover F- $180 Make An Offer! Cream/offwhite pages, small 4/14 written on front cover in grease pencil G+ $90 Make An Offer! Offwhite pages G+ $95 Make An Offer! Offwhite pages VG+ $160 Make An Offer! DRIS FC, offwhite pages VF+ $25 Make An Offer! Tiny AD FC, offwhite pages VF+ $25 Make An Offer! cream/offwhite pages F- $8 Make An Offer! Offwhite pages, nice copy VF+ $32 Make An Offer! offwhite pages G+ $6 Make An Offer! Offwhite pages, Small S written on back cover in pen CGC 9.2 NM- $100 Make An Offer! Offwhite/white pages, cover detached from bottom staple VG+ $15 Make An Offer! offwhite pages, 2 names written on bc in pen VG+ $12 Make An Offer! Offwhite/white pages, AUG 16 stamped on front cover, cover detached from bottom staple F $9 Make An Offer! White pages, picture frame marvel CGC 8.5 VF+ $30 Make An Offer! Offwhite/white pages, sunshadow bottom back cover NM- $425 Make An Offer! Offwhite/white pages CBCS 9.2 NM- $425 Make An Offer! Offwhite/white pages, structurely nice, indent that breaks color on front cover VF+ $275 Make An Offer! Offwhite/White pages CBCS 7.0 F/VF $125 Make An Offer! White pages CGC 9.2 NM- $140 Make An Offer! Cream/Offwhite pages, water stains G/VG $10 Make An Offer! Offwhite pages CGC 9.4 NM $150 Make An Offer! Offwhite pages G/VG $10 Make An Offer! Offwhite/white pages, picture frame marvel VF+ $50 Make An Offer! Cream/Offwhite pages G $7 Make An Offer! Offwhite/white pages CBCS 9.6 NM+ $185 Make An Offer! White pages PGX 9.4 NM $175 Make An Offer! White pages, cover detached from bottom staple, 2/213 written on top of front cover VG+ $18 Make An Offer! Cream/Offwhite pages G/VG $10 Make An Offer! Offwhite pages, FEB 13 stamped on front cover VF $18 Make An Offer! White pages, subscription crease VG/F $4 Make An Offer! Offwhite/white pages F- $4 Make An Offer!